September last year was a new start for me, and a new challenge as Head of Department. Like a lot of schools, there was a lot of work that had already been done to prepare for the new GCSE, but it was also clear that we still had a lot of work to. I want to blog about how we are going about the challenge of changing things up. Our main challenges were / are ..
We started with a big push on spontaneous speaking, especially at KS3, and this has proved to be successful as far as we have taken it. We have used techniques that a colleague learnt at a local ALL twilight group on spontaneous speaking run by Julie Hall. She has written an article for ALL where it's explained, which you can find here. 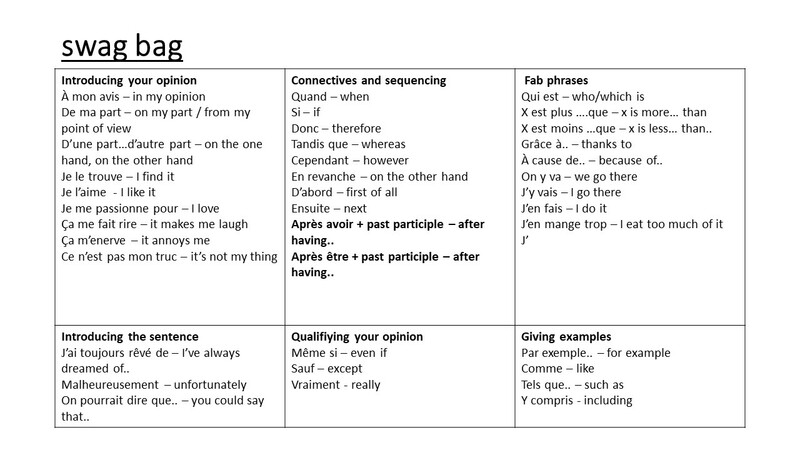 We showed them how useful avoir/être are, and we introduced phrases for the register, and it's the creative ones that have been successful, so if someone is absent, they speculate that they're skipping lessons with Beyoncé to go to MacDonalds. Another one that students enjoy using is saying where they'd like to be e.g. I'd like to be in bed / I'd like to be in town with my friends. Students get points (which they record at the back of the book) for speaking French / German, and there is a mini-prize every week. They get points for reacting during pairwork, and we set tasks up so that they know it's an expectation to react. No real life conversation simply involves question 1, answer 1, question 2, answer 2. They love saying "Tu rigoles!" or "Spinnst du?" This has also motivated weaker students. In my bottom set year 8 lesson last week, the technology crashed on me. I heard a voice from the back say, "Quel désastre!". This class will also ask for the correct colour highlighter in French. They feel able and motivated to do it, and it has brought a buzz to the classrooms. We wanted to give a bigger push on structures rather than just single words, and so introduced key sentences to our vocabulary lists. These aren't Knowledge Organisers as they are being discussed, as we felt that they still needed to be able to access the individual words as well, but we have put "top 10 sentences" at the start of each organiser, and these highlight the key structures, and also showcase how to extend sentences. These have been integrated into our end-of-unit assessments, and used in weekly vocab tests, but that's about it and only some students have cottoned on to the fact that they can also use them in their own work. It is clear, however, that we have a lot of work to do to get the students to make the most of them, which brings us to our longer list of "Things we need to work on". Having been so encouraged by the progress made by the spontaneous speaking in KS3, I was appalled that the Year 9s, who have their exams soon, just wanted to know "which paragraphs to learn" for the speaking assessment. As far as they are concerned, speaking is still just a case of rote learning answers completely divorced from the content,so the same problems came up with them parroting things they didn't understand, with of course the inevitable mistakes that made their sentences gobbledegook. Yes, there needs to be an element of them being able to showcase the best that they can do, but we need to help them with their revision, and build in some element of quick-fire questions that they need to respond to. It has become painfully clear that all year groups have only the vaguest idea about how to revise, even students who appear reasonably confident. This is clearly urgent for Year 11, but we need to address it now in all years. This starts the conversation, but then needs to be continued in class. We're going to focus on introducing one new element a week, both to staff and to students. Teach the BSL words for question words. Teaching students the concepts of "building blocks" (my phrase for core structures) and how to use them. Getting students to speak from doodles, and not worry about getting it "word for word"
Wish us luck - I will post about our progress in future posts. With the mock speaking exams for Year 11s and annual exams for Year 10 just around the corner, the issue of revision skills has loomed large recently. Both my Year 10s and, more worryingly, some of my Year 11s have been resistant to the revision techniques I've introduced to them to help them learn for the speaking exams, and they have struggled to choose the right tool for the right situation. I see them clinging to the methods that worked for them at Key Stage 3, which don't fit the brave new world of the new GCSE that they find themselves in. The phrase which has echoed through recent times is "never assume". Never assume that demonstrating revision skills will be enough. Showing them the success of a technique doesn't necessarily mean that they have made the connection with when and why to use it. We need time in class to have those learning conversations where you can get the students to think about why certain strategies are effective for which reason. My experience in the last few months is that my students use certain techniques blindly without knowing why, meaning they make bad choices. Beyond the old chestnuts of "reading through" or "writing it out again and again", I've come across some new variations. Never assume they know the difference between different techniques. We've had success with memrise.com for promoting regular vocabulary learning, but some students now think that will also see them through the speaking exam!!?! Never assume they've got it. Once is not enough - the revision skills have to be practised on a very regular basis, and be integrated into the schemes of learning. Never assume you can leave these techniques to KS4. Bad habits picked up in KS3 take an age to unlearn. Never assume they'll make the link between learning words in French with how they learnt spellings in primary school unless you make it for them. Look-Say-Cover-Write-Check needs reminders at the beginning of September at the very least. Talk to them about how they learnt in primary. Never assume (and this I learnt again to my cost this week) they will understand how to make their own flashcards for revising for speaking assessments. And, of course, never assume they know how best to use them. This week I wanted to do a revision lesson with my Year 7 French middle set. I decided we would make our own flashcards for the key questions from the module we had just finished. A nice, easy lesson, I thought. Oh, how wrong I was. Everything seemed to throw up misunderstandings. Despite showing them a model on the board, some seemed genuinely mystified by the whole concept. For others, putting the question on one side and your own personal answer on the other seemed new. Not cramming too much onto one card was another skill quite a few needed to learn. That was before we even got round to using them. I wanted them to use the cards in 3 steps. 1. Ask the question and let your partner see the full answer. 2. Get the partner to answer the question but this time only revealing the starter words on the flashcard. 3. This time the partner has no help. After a few minutes of pairwork, I heard several choruses of "j'ai fini". A closer questioning showed that they had done the task in order to get it over and done with, rather than with the deliberate aim of using the different stages to actually learn their answers. A lot of conversations and coaching was needed to get the penny to drop. I finished that lesson with a headache. I was determined to get them to understand it more carefully, so I came back next lesson for a second go. Example cards, another explanation. More time. The second half of the lesson, the class was transformed. I had a class that worked happily quizzing each other and coaching each other. A real taste of independent learning. I say "a taste", because if I don't do this again next time, they will forget all about it, apart from a few diligent students. And for the students: never assume that you've learnt it just because you've spent time learning. In the last 10 minutes, I got them to write out what they could remember, then use their green pens to see where they needed to focus their efforts. 1. The activity combines language skills with heightening awareness of exam formats or requirements. 2. By doing activities that emphasize key structures and start the process of memorising and internalising key structures and language. In many senses, I have been doing this already, but sharpening this up is beginning to make a difference. What I’m going to look at in my next few blogs are some examples of strategies I’m using in class. These play such a crucial role. Here are some favourites of mine. 2 photos – match the sentences to the card. Once you’ve gone through it, give them 30 seconds to memorise, then show a version with key structures blanked out. Get them to write them again on their mini-whiteboards. 2 photos – 2 descriptions. Match the photo to the description, then similar process to before. This allows you to model a full answer for the speaking photo card. We call our bank of speaking questions for each topic “summary questions” so that the students don’t just think of these as questions just for the speaking exam. We have a real task on our hands getting them to learn them, so we’ve started giving them a couple of key questions a week. We also desperately need them to practise writing to a bullet point, and for them to see the connection between the summary questions and the writing exam. They also need practice in understanding what is required of the bullet point. We give them 2 questions to learn, but instead of always testing as a peer assessment, we sometimes put them as writing bullet points on the board and give them 10 minutes to answer one of the bullet points. Qu’est-ce que tu fais pendant ton temps libre? My students have found this useful, and it seems to be helping them to make the links between their learning and the exam. I’m still using my lollipop sticks starter, which I talked about here, but I now follow it up with a grid in the past, present and future that is similar to grids seen in the reading exam specimens, which I get them to fill in, either with or without prompts. This weekend I had the pleasure of spending my Saturday with colleagues at a conference on preparing for the new A-Level hosted by the wonderful ALL Yorkshire, with Robert Pike and Rachel Tattersall presenting. I can’t possibly do justice to everything that was presented, but below are some of the things that I took away from today, and the thoughts I had whilst listening to the presentations. A lot of the comments below are specifically AQA, but the general gist will apply to any board. 1. Get the information from the exam board websites now! You need to get yourself familiar now with the exam structure, especially for the speaking exam. It was news to me that for the A-Level, the candidates only have 5 minutes preparation time, and this is done in front of the examiner! Not only that, but although they only do one stimulus card, they have to ask 2 questions. The devil truly is in the detail! The advice on conduct of the examinations is up on the website (e.g. http://www.aqa.org.uk/subjects/languages/as-and-a-level/german-7662/assessment-resources ) so now is the time to trawl through the website to get what you need. On the German A-level page there are the detailed instructions for the speaking test, and commentaries on sample answers for both the essay paper and the speaking test. You should also have had an advisor assigned to your school for the Independent Research Project. If you haven’t heard (I haven’t! ), chase it up with your exams officer. IRP - My students have started their research, and they are now beginning to look towards how to turn that into something which can be used for the exam. Timings are going to be crucial – those 2 minutes of presentation can earn up to 5 marks for AO4, so it’s important for this to be structured well, but of course, not so crammed that the students rush and become unintelligible. A 9 minute discussion is a long time, and it’s going to be crucial that they have enough material and considered thoughts on this to last this amount of time. The training prompted me to go home and look at the form for the IRP (also on the website). There is room for between 2 and 10 headings for the discussion. The more headings used, the more control the candidate will have over the direction of the discussion. It was commented on that a mark of 0/10 for the translation into the TL was not uncommon. Lots of small mistakes evenly distributed would lead to this, so training our students to be confident with grammar, and to look carefully at what is required (singular /plural; definite article / indefinite article) is essential. How can we help in class? Lots of practice of changing and manipulating language. The old adage of making maximum use of any text you do in class still applies. 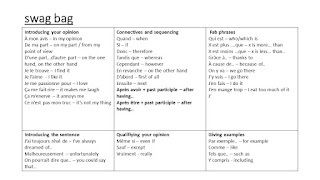 Getting students used to finding verbs but then change tenses, changing 1st to 3rd person (especially with irregular verbs in German), spotting the change in role and therefore the change in case – these are all things that come with regular practice. I was intrigued to find out that examiners do count the words for the summaries. They do allow for a few additional words, and will mark up to 10 words over the word-limit, up to the first natural break. That means that candidates must stick to the bullet points, and be guided by the number of points awarded. · Avoid introductions and keep to the bullet points. · Make rough notes first before doing the final summary – it will make it more concise. · Answer the bullet points directly. · In class, practise transcribing, especially focusing on verb endings, article spellings etc. Examiners look first a AO4 (critical response). Students need to demonstrate accurate and detailed knowledge, evidence from the text, and develop arguments and draw conclusions. The best essays are not the long essays – 350 words are more than enough. They need to be tight, relevant and varied. Encouraging students to choose their examples and quotes carefully and write with control, needs a lot of practice. Robert Pike talked about using ExExExEx to get students to think about structuring paragraphs. Personally, I use a variation on PEEL, and use it in my marking. By using this in my marking, the students have been able to see more clearly whether they have been making too many descriptive points, rather than developing ideas. One of the big concerns for this new A-Level is whether students have a good understanding of the knowledge of society, and can they recall this information quickly. There is a lot of key information to remember, and although they don’t need specific figures, they do need to know trends, rough comparisons and be able to talk and comment about these and examples from the TL countries. We need to help our students to get control over this by getting them to do summarising activities at the end of the topic. This should also mean that they have an easy overview of the whole topic. Favourites that were mentioned were making a mind map, summary page of facts, doing a poster, doing a presentation to the class with a word-limit on the slide to stop the dreaded put-a-text-up-then-read-it-out disaster. I have several students who hate mind maps and posters, and are definitely bullet-point people. I insist on a second column beside the stats and facts which states what conclusions they can draw from them. · Speaking from word cloud prompts reinforces key ideas. · Using prompt cards with key language and a key idea that they have to include builds up their level of language. · Rank ordering (diamond 9, for example) with justification of their placings. Connect 4 – but instead of providing a word, they have to be able to answer the question e.g. How has family changed since 1960s? Beetle Drive – 1 question for each side of the dice. Students have to answer the relevant question to be able to cross off that particular square. BUT (and this is the bit I really liked) if they throw the same number again, they have to add to their answer. All the way through the training session, it occurred to me again and again how crucial the questions we pose in class are. One question I really need to consider for myself is whether I’m spending enough time asking higher order questions that give students the opportunity to evaluate, analyse and compare aspects of the TL country. Unlike excel spreadsheets, which we've had no choice but learn to love, mailmerge seems to be a little known function. I discovered it a couple of years ago, but as I talk to lots of colleagues who've never used it, I thought I would share my very basic use of it. Feedback on exams. Except with the most switched-on classes, it can be a nightmare. 4 skills, at least 3 on paper form. No matter how hard I had tried to make it clear, students were still confused. "Which one's my overall grade?". Reading out the levels/grades to the whole class or going round individually were also less than satisfactory. As I already have a spreadsheet with the grades/levels for each skill, I can easily make individualised feedback for each student. Now that I am wise in the ways of mailmerge, it takes me 5 mins to create feedback from the spreadsheet which also makes it clear for the student and minimises my stress levels. What's not to love? 1. When I'm marking the exams, as well as entering grades, I also enter a remark in 2 extra columns: "what you did well" and "next steps". I normally do this on a separate piece of paper - doing it into a spreadsheet also gives me a great overview for parents' evening and reports. 3. Open a word document and choose "Mailings" and select "Start mailmerge" and choose "normal document". Write the basic format of the document you want. 4. Now you need to choose the recipients. That's the students from your spreadsheet. So - choose "existing list" then choose your spreadsheet and the page that has your class on it. 5. Now enter the fields where you need them. 6. Choose preview results and double-check. Then finish and merge. I always choose "edit all" . And Voila - pain-free feedback. I'm coming to the end of my first year at my new school, so the annual reflection about what's worked and what hasn't is even more essential. One of the biggest battles I have had this year has centred round learning for assessments. Apart from my Year 7s, all my other year groups have clung to the idea of memorising paragraphs. The disastrous legacy of the now defunct GCSE is proving hard to shift. The battle is, of course, most acute in year 10, who have less time than other year groups to make that shift. In their writing exam, despite me saying that the questions would be adapted from the summary questions they had done for each topic, many students simply tried to learn all of these answers by rote. This meant that we had the familiar problems of minds going blank after the first line, but with the added horror that they didn't tweak the language they knew to fit the actual question. When talking with the students, it became apparent that I still had my work cut out. What I thought I had been teaching them i.e. how to use key verbs, how to use the language constructively, was not what the students were taking in. Basic mistake. In many ways, this is a variation on another age-old battle to persuade students that "just reading through" is the worst revision technique ever. I get it - rote-learning of paragraphs has a good feeling to it. It's also really definite - there's my paragraph, that's what I've got to learn. Doesn't matter if I don't know what it means, I've just got to learn it. Boom! Of course, breaking things down, knowing what all the elements mean - that's hard work, and it looks like you're making less progress at first, but it's real learning. There will still be a place for learning answers so that you can answer questions for the general conversation, but it cannot be with this mindset that you just learn and regurgitate. I'm about to get my year 10s to prepare a for another writing assessment, so these are some of the things I've done differently since January. 1. Lots of explicit talk about learning - lots of use of lego imagery! 2. Adapting the use of photos as starters to emphasise the use of key language. 3. Making memrise.com a bigger part of the learning process - showing the leaderboard, but also (crucially) showing which % of the course they have mastered. 4. Making them fill in a sheet of key language for the summary questions before they learn them - broken down into opinion phrases, verbs, adjectives/adverbs, connectives, fab phrases. On the sheet they fill in the French and the English. It's a faff, and I make them do it in class, because they don't like doing it, and I can quality control it. It then allows them to test each other. 5. My lollipop-stick games on key verbs. Will it work? We will see. Is anyone else in the same boat? I'd love to know how you've tackled it. It's different to a learning mat, because they are responsible for choosing whether the word or phrase is worthy of inclusion, which means that we have a conversation about why these phrases are useful. It also puts the onus on them to think about it and maintain it. Now, when we do extended writing, they have to nominate at the top of their work a minimum of 3 swag bag phrases that they can use in their work. It's a work in progress, and we will add to it in the future, but it's been useful for getting them out of their "j'aime...parce que c'est super" straitjacket.